Our November/December 2016 issue is out! 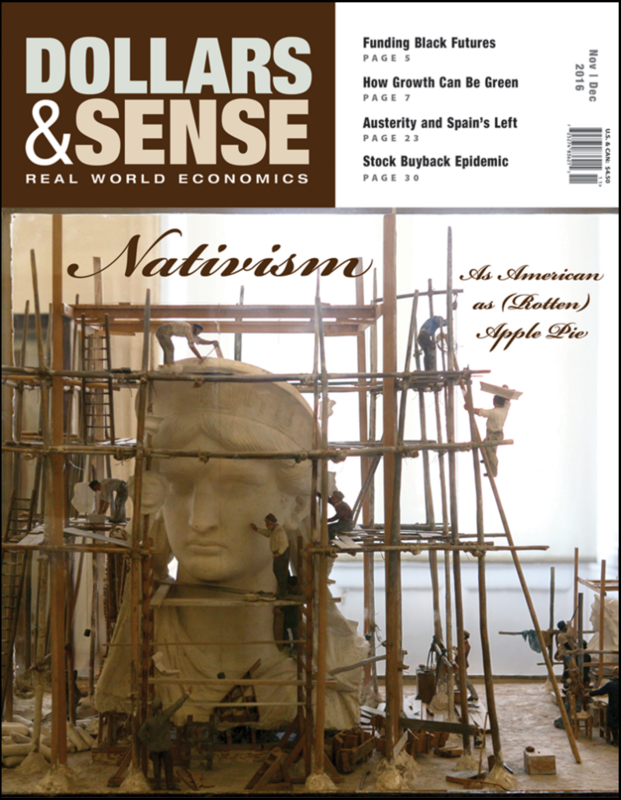 I just posted the cover story, Jerry Friedman’s Nativism: As American as (Rotten) Apple Pie. It is both apt and ironic. The most “American” symbol of liberty is an immigrant. The irony should be evident in today’s vile frenzy of nativism—the fulminations against Mexican immigrants, the fantasies of border walls and mass deportations, the disturbing calls for a ban on Muslim immigration and registration of those already here. From economic historian (and regular D&S columnist) Gerald Friedman, we have a historical account of America’s long history of anti-immigrant outbursts—from Benjamin Franklin before the United States even existed to the KKK of the 1920s (which, in addition to its white supremacism, gave voice to the ugliest anti-Jewish, anti-Catholic, and anti-immigrant impulses). He explains how present-day nativism fits the patterns. The aptness may not seem so obvious, but Friedman’s account also belies a view of U.S. history as one of unrelenting xenophobia. Between episodes of nativist rage, there were periods of openness to immigration; during the high tides of anti-immigrant sentiment, also noble defenses of equal rights and civil liberties; in their wake, an eventual reopening, and a reaffirmation of belief in this as an “immigrant nation.” Even today, the vocal anti-immigrant minority notwithstanding, most U.S. residents express positive views about immigrants and what they bring to the country. Of course, the nativist eruption is only part of a wider turmoil gripping the United States and the world. Polly Cleveland reviews Arlie Hochschild’s Strangers in Their Own Land, the sociologist’s account of her foray into Louisiana Tea Party country. Hochschild’s attempt to understand and empathize with Tea Party supporters, Cleveland argues, reveals people jealously defending their place in the social pecking order—as is typical of high-inequality and low-mobility societies. Biola Jeje’s “Active Culture” turns our attention to the Movement for Black Lives. This is a country, she reminds us, where Black people’s personhood has often been acknowledged more grudgingly than that of capitalist corporations. Activists are confronting a reality of police violence and mass incarceration, crises of housing and education, inadequate infrastructure and environmental degradation—all of which disproportionately impact African Americans. The disparities, of course, are not new. The movement’s bold vision confronting racism and neoliberalism today is an encouraging development. Crossing the Atlantic, we see another continent where the future is uncertain. Alejandro Reuss continues his series on the eurozone crisis and European social democracy. In this installment, he addresses the rise of “Third Way” figures—who turned their backs on class-struggle politics and counseled reconciliation with neoliberalism—to leadership of the social democratic parties in the largest European countries. Jorge Amar, David Glotzer, and Scott Ferguson consider the economic program of Spain’s leftist Podemos party, and ways in which it has failed to embrace the changes necessary to pull Spain out of its current crisis. The authors point to the necessity of a universal job guarantee, a “left exit” (or “lexit”) from the euro, and an understanding of Modern Monetary Theory (MMT) in transcending conventional balanced-budget thinking. Nina Eichacker, meanwhile, considers the ramifications of this past summer’s Brexit vote on the UK economy and especially its financial sector. She weighs factors pointing both toward stability and toward instability. Pro-Brexit voters, she concludes, might not get the populist outcome they hoped for, in an economy heavily reliant on finance and with a state committed to protecting financial interests. The cover image for this issue shows Liberty under construction. (It is actually a model, on display at the Musée des Arts et Métiers in Paris.) That is an apt metaphor, in the United States, in Europe, and the world over. The version of “liberty” offered by those in power has been, at best, incomplete; at worst, a cruel hoax. It’s high time for a redesign.